The U.S. unauthorized immigrant population has leveled off nationally after the Great Recession, but state trends have been more volatile. From 2009 to 2012, according to new Pew Research Center estimates, the population of unauthorized immigrants rose in seven states and fell in 14. Five East Coast states were among those where the number of unauthorized immigrants grew from 2009 to 2012—Florida, Maryland, New Jersey, Pennsylvania and Virginia. Numbers also rose in Idaho and Nebraska, according to the center’s estimates. Nationally, the population of 11.2 million unauthorized immigrants in 2012 was unchanged from 2009, the year the Great Recession ended (Passel, Cohn, Krogstad and Gonzalez-Barrera). The number had peaked in 2007 at 12.2 million and declined for the next two years during the recession. Why did unauthorized immigrant populations decline in 14 states from 2009 to 2012? According to a Pew Research analysis, the losses in 13 of them were due to drops in the number of unauthorized immigrants from Mexico. The exception was Massachusetts, where the overall decrease was due to a decline in the number of unauthorized immigrants from other countries. In six of the seven states where populations of unauthorized immigrants grew from 2009 to 2012, it was because the number of non-Mexicans increased; the number of Mexicans declined or did not change. The exception was Nebraska, which had a small but statistically significant increase in Mexican unauthorized immigrants in those years. There is wide variety in state populations of unauthorized immigrants, according to the Pew Research estimates. More than half the 2012 unauthorized immigrant population (60%) lived in the six states with the largest numbers of such immigrants—California, Florida, Illinois, New Jersey, New York and Texas. At the opposite end, six states (Maine, Montana, North Dakota, South Dakota, Vermont and West Virginia), had fewer than 5,000 unauthorized immigrants each in 2012. Estimates for all states of unauthorized immigrant populations can be found in the appendices. There has been renewed debate about unauthorized immigration in recent weeks, as President Barack Obama has restated his intention to take executive action that could give relief from deportation and work permits to some of this population (New York Times, 2014). Republican leaders, who will control both houses of Congress next year as a result of the mid-term elections, have cautioned that any executive action would torpedo the chances for a bipartisan immigration reform bill. Among the groups widely thought to be under consideration for relief from deportation are long-time U.S. residents with U.S.-born children. The Pew Research Center estimates that 4 million unauthorized immigrant parents, or 38% of adults in this population, lived with their U.S.-born children, either minors or adults, in 2012. Of these, 3 million had lived in the U.S. for 10 years or more (Passel, Cohn, Krogstad and Gonzalez-Barrera, 2014). Unauthorized immigrants accounted for 3.5% of the 2012 U.S. population of nearly 316 million and 26% of the nation’s 42.5 million foreign-born residents, according to the center’s new estimates. Both shares were larger in 2007, the peak year for the nation’s unauthorized immigrant population, at 4.0% and 30%, respectively. In addition to unauthorized immigrants, the nation’s foreign-born population of 42.5 million people in 2012 consisted of 11.7 million legal permanent residents, 17.8 million naturalized citizens and 1.9 million legal residents with temporary status (including students, diplomats and “high-tech guest workers”). The 8.1 million unauthorized immigrants who were working or looking for work in 2012 made up 5.1% of the labor force. Both of those estimates are unchanged from 2009. The number in the labor force has remained between 8.1 million and 8.3 million since 2007. 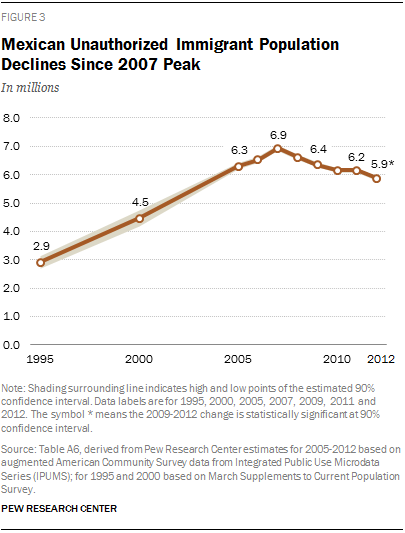 The share of unauthorized immigrants in the workforce peaked in 2007, at 5.4%. Among states, the share of unauthorized immigrants in the labor force is highest in Nevada (10.2% in 2012). Other states with high shares in 2012 include California (9.4%) and Texas (8.9%). In 2012, children with at least one unauthorized immigrant parent accounted for 6.9% of U.S. students in kindergarten through 12th grade. A significant majority of these students were born in the U.S. (representing 5.5% of all students in 2012); the rest (1.4% of all students) are unauthorized immigrants themselves. The share of these students with unauthorized immigrant parents climbed to 7.2% in 2007 from 3.2% in 1995. States with the largest shares of students with unauthorized immigrant parents include Nevada (17.7%), California (13.2%), Texas (13.1%) and Arizona (11.0%). Mexicans are a majority of unauthorized immigrants (52% in 2012), but both their numbers and share have declined in recent years, according to the Pew Research estimates. Although the U.S. population of unauthorized immigrants was stable from 2009 to 2012, the number of Mexicans in this population fell by about half a million people during those years. According to the new Pew Research Center estimates, there were 5.9 million Mexican unauthorized immigrants in 2012, compared with 6.4 million in 2009. The decline likely resulted from both an increase in departures to Mexico and a decrease in arrivals from Mexico (Passel, Cohn and Gonzalez-Barrera, 2012). As the Mexican numbers continued to drop between 2009 and 2012, unauthorized immigrant populations from South America and from a grouping of Europe and Canada held steady. Unauthorized immigrant populations from Asia, the Caribbean, Central America and the rest of the world grew slightly from 2009 to 2012. The unauthorized immigrant estimates throughout this report are produced using a multistage method that subtracts the legal foreign-born population from the total adjusted foreign-born population; the residual then is used as the source of information about unauthorized immigrants. The main source of data for estimates from 2005 on is the U.S. Census Bureau’s American Community Survey; estimates for 1995 and 2000 use the bureau’s March Current Population Surveys. Because they are based on updated data, the new estimates of unauthorized immigrants for states and the nation in this report supersede previously published Pew Research Center estimates. All trends have been updated to reflect the most current data. See Methodology for more details. This report provides estimates of the 2012 unauthorized immigrant population and estimates of recent population trends in each of the 50 states and the District of Columbia (see appendix for full data). It also estimates national and state-level shares of unauthorized immigrants in the overall population, foreign-born population and labor force, and the share of students in kindergarten through 12th grade with at least one unauthorized immigrant parent. The report also includes estimates of the birth countries and regions of unauthorized immigrants at the state and national levels. Accompanying this report are interactive maps showing unauthorized immigrant population size, as well as shares of the overall population, shares of the foreign-born population and shares of the labor force, in the 50 states and the District of Columbia. Additional interactive maps show the share of elementary and secondary school students with at least one unauthorized parent, and the share of Mexicans among unauthorized immigrants, by state. Another map displays change for 2009 to 2012 in the unauthorized immigrant population at the state level. The estimates use the “residual method,” a widely accepted and well-developed technique based on official government data. The data come mainly from the American Community Survey and March Supplement to the Current Population Survey, conducted by the U.S. Census Bureau. For more detail, see Methodology. This report was written by Jeffrey S. Passel, senior demographer, and D’Vera Cohn, senior writer. Editorial guidance was provided by Claudia Deane, director of research practices, and Mark Hugo Lopez, director of Hispanic research. Eileen Patten, research analyst, and Anna Brown, research assistant, created charts and tables; number-checked the text, graphics and interactive maps; and assisted with formatting and production. Michael Keegan, information graphics designer, created the maps used in this report and developed some of its charts; Russell Heimlich, web developer, developed the interactive versions of those maps. Michael Suh, associate digital producer, provided web support. All are on the staff of the Pew Research Center. Marcia Kramer of Kramer Editing Services, was the copy editor. Find related reports online at pewresearch.org/hispanic. “Foreign born” refers to an individual who is not a U.S. citizen at birth or who, in other words, was born outside the U.S., Puerto Rico or other U.S. territories and whose parents were not U.S. citizens. The terms “foreign born” and “immigrant” are used interchangeably. “U.S. born” refers to an individual who is a U.S. citizen at birth, including people born in the United States, Puerto Rico or other U.S. territories, as well as those born elsewhere to parents who were U.S. citizens. When referring to children of unauthorized immigrants, the terms “U.S. born” and “U.S. citizen” are used interchangeably; a small number of these children may be naturalized citizens. The “legal immigrant” population is defined as people who have been granted legal permanent residence; those granted asylum; people admitted as refugees; and people admitted to the U.S. under a set of specific authorized temporary statuses for longer-term residence and work. This group includes “naturalized citizens,” legal immigrants who have become U.S. citizens through naturalization; “legal permanent resident aliens” who have been granted permission to stay indefinitely in the U.S. as permanent residents, asylees or refugees; and “legal temporary migrants” (including students, diplomats and “high-tech guest workers”) who are allowed to live and, in some cases, work in the U.S. for specific periods of time (usually longer than one year). “Unauthorized immigrants” are all foreign-born non citizens residing in the country who are not “legal immigrants.” These definitions reflect standard and customary usage by the U.S. Department of Homeland Security and academic researchers. The vast majority of unauthorized immigrants entered the country without valid documents or arrived with valid visas but stayed past their visa expiration date or otherwise violated the terms of their admission. Some who entered as unauthorized immigrants or violated terms of admission have obtained work authorization by applying for adjustment to legal permanent status, obtaining Temporary Protected Status (TPS) or receiving Deferred Action for Childhood Arrivals (DACA) status. Data are very limited, but this “quasi-legal” group could account for as much as 10% of the unauthorized population. Many could also revert to unauthorized status. The “labor force” refers to people ages 16 and older who are employed or looking for work. Obama’s expected immigration order: How many would be affected?